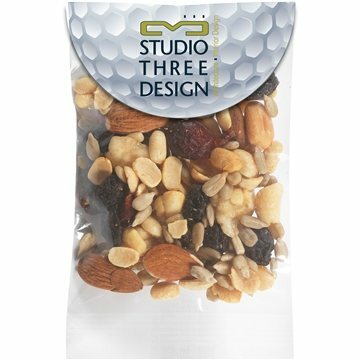 Bag filled with trail mix (1 oz). Raisins, banana chips, cranberries, peanuts, almonds, sunflower seeds. Pick from our stock golf motif or totally customize the imprint area. Header cards can be printed on both sides in as many colors as you would like! 1 oz of healthy snacking.